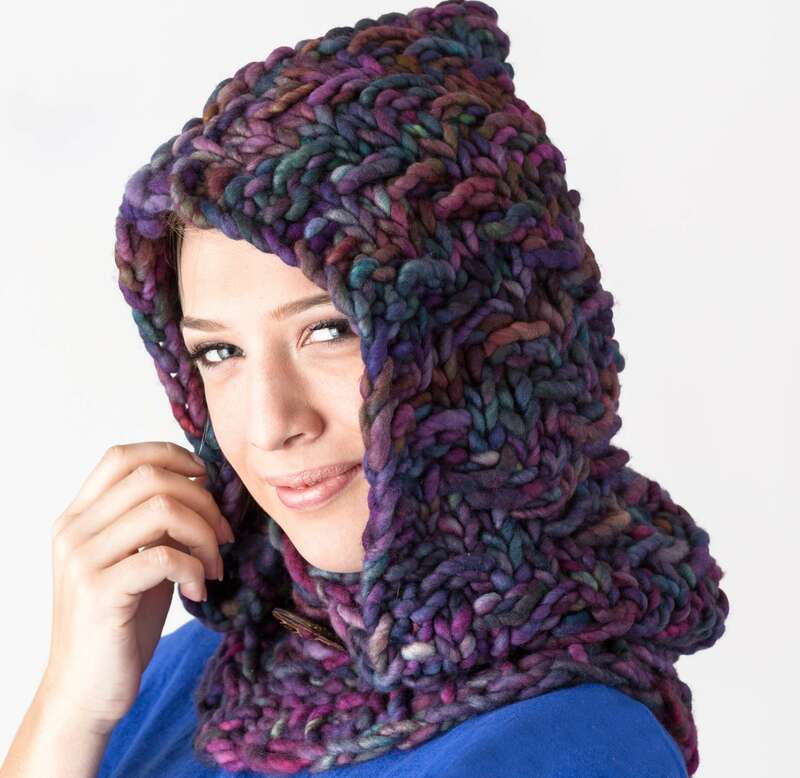 The luxurious stitch of this hooded cowl is perfectly paired with the deep hues of this kettle dyed, 100% merino wool yarn. Its soft as a cloud comfort, with the long trailing lines of rich color, is the perfect accessory for your cold weather wardrobe. Knitting loom: (6) Zippy Looms, and Zippy Corners. 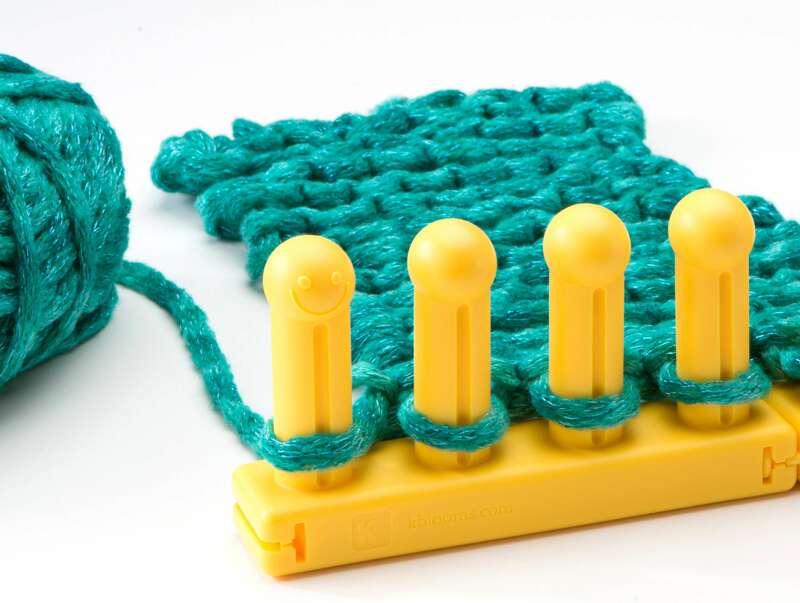 Notions: loom tool, 6.5mm crochet hook (for cast on and help with possible missed stitches, etc), one peg marker to mark first peg (can be tied scrap yarn or rubber band), scissors, yarn needle, row counter, optional: large decorative button. 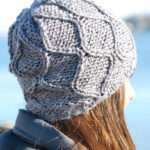 Gauge: 5.5 stitches and 8 rows per 4” in pattern. Skills Needed: Knit, Purl, Slip with WY in front, Chain CO and Basic BO. SWYF: slip peg with working yarn carried to front. S1: slip or skip the peg. This project is first worked in the round, then is split to work as a panel. The yellow shaded line denotes this in the chart. Please read all rows before this as rounds starting from the right to the left (clockwise). 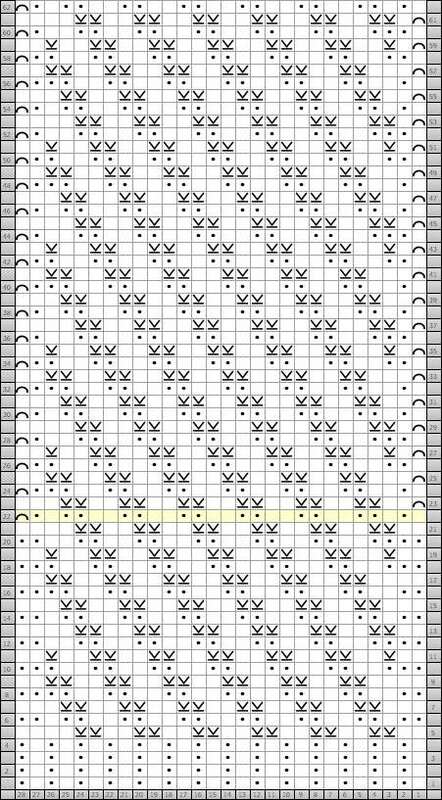 At the yellow line (Row 22), the pattern will begin to be read in the side to side direction that is noted on the chart. A SWYF in the pattern denotes that this peg will not be worked, but will have the working yarn carried to the front of the work. To do this, simply remove the loop already on the peg, slip the WY in front of the work and behind the peg, then replace the held loop back onto the peg. 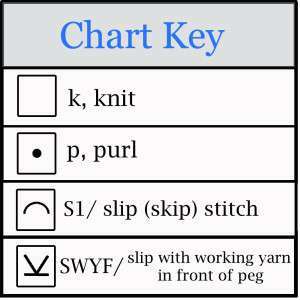 For help with reading charts, please see the Stitchology I post for a detailed explanation, and you’ll be ready to go! *Please also see Pattern Notes above for specific instructions on reading this particular chart. Set looms to 28 pegs in the round. Using one strand of yarn, CO to all 28 pegs in a clockwise direction. Rounds 1-4: *k, p, rep from *. Round 5: *k2, SWYF across 2 pegs, rep from * to last 4 sts, k4. Round 6: p2, *k2, p2, rep from * to last 3 sts, k1, p2. Round 7: k3, *SWYF across 2 pegs, k2, rep from * to last st, k1. Round 8: *p2, k2, rep from * to last 4 sts, p4. Round 9: k4, *SWYF across 2 pegs, k2, rep from * to end. Round 10: p3, *k2, p2, rep from * to last sts, p1. Round 11: k2, SWYF, k2, *SWYF across 2 pegs, k2, rep from * to last 3 sts, SWYF, k2. Rounds 12-21: rep rounds 5-11, plus one additional round 5. Begin to Panel Knit at this point. The first row will be worked counterclockwise. Row 22: S1, p1, k1, p2, *k2, p2, rep from * to last 3 sts, k1, p1, k1. Row 23: S1, *k2, SWYF across 2 pegs, rep from * to last 3 sts, k3. Row 24: S1, p3, k2, *p2, k2, rep from * to last 2 sts, p1, k1. Row 25: S1, k3, *SWYF across 2 pegs, k2, rep from * to end. Row 26: S1, p2, *k2, p2, rep from * to last st, k1. 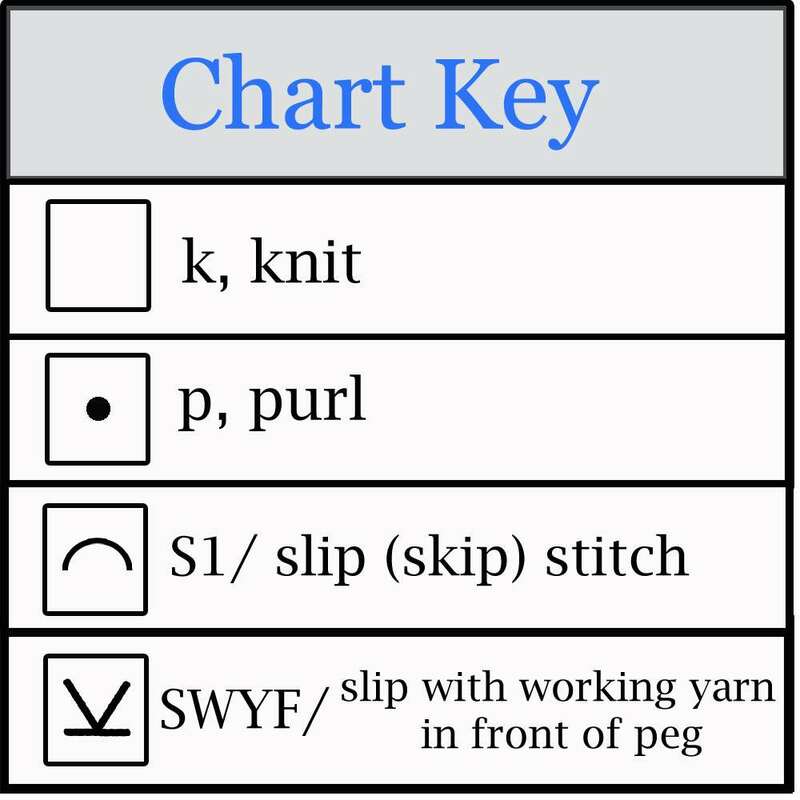 Row 27: S1, k1, SWYF, k2, *SWYF across 2 pegs, k2, rep from * to last 3 sts, SWYF, k2. Row 28: S1, p1, *k2, p2, rep from * to last 2 sts, p1, k1. Row 29: S1, k1, SWYF across 2 pegs, k2, rep to last 2 sts, k2. Row 30-62: Rep rows 22-29. BBO loosely across all pegs. Wrap WY once around loom and cut here. Use this tail for seaming the top edges together (samples uses the mattress stitch). Pull all ends to the inside and weave in loosely. 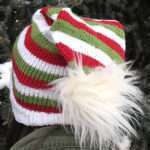 If desired, stitch one or more large decorative button(s) to the front center section. After it’s blocked will the SWYIF’s not be as loose? They don’t look as loose in the photos as mine does.. It is definitely possible that your slipped stitches will tighten up upon blocking. What I found with mine was that they evened out quite a bit after I blocked. I used a hot steam blocking, which also may have helped them snug up a bit. It also might be a tension issue. You’ll want to make sure to be pulling your SWYF’s so that there is no slack in them from peg to peg. It’s not a super *tight* pull…just enough so that they don’t end up sagging afterward.